Continuing the Kaş Lykia Festival weekend on Saturday night I went again to the theatre and saw the Moliere play “Tartuffe”. I had a very sketchy idea of the story of the play and would have liked my Turkish to be good enough and quick enough to be able to follow the story more effectively since it was all in Turkish but I enjoyed it anyway. I took a cushion this time and was much more comfortable on the stone seats of the theatre than the previous night. The audience were “kindly forbidden” to take photographs so forgetting to take my camera wasn’t the disaster that I thought it would be. 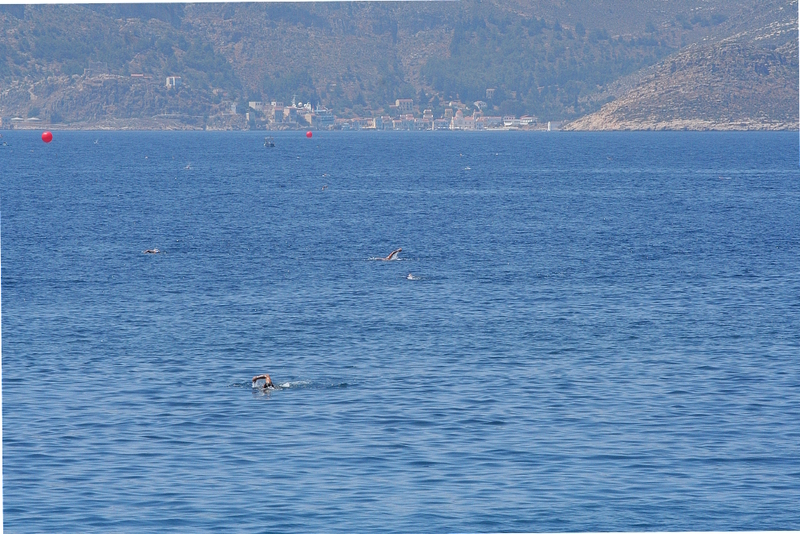 On Sunday morning the swimming race from Meis to Kaş was scheduled. 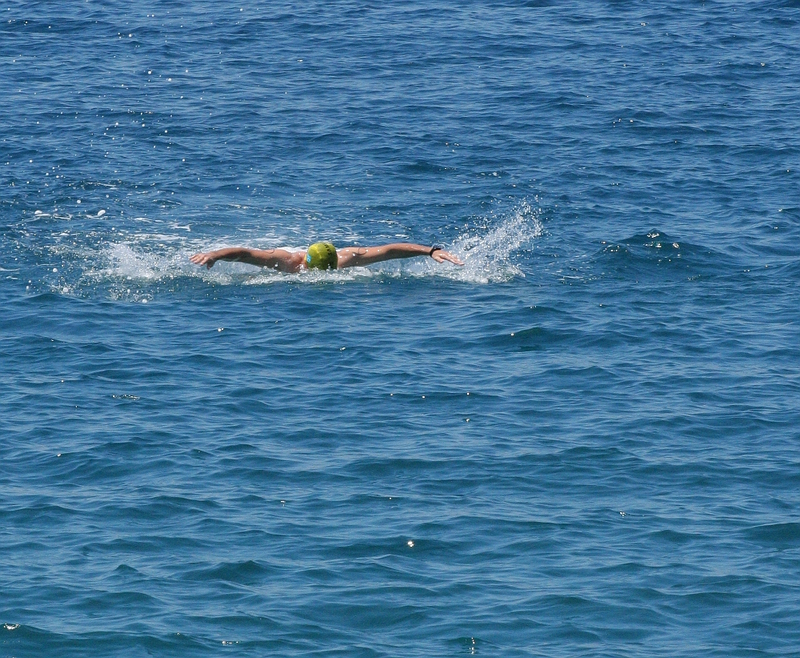 Since the swimmers start in Meis there wasn’t a great rush to get to Kaş early and by the time I turned up the first few had already finished. For someone who has never been a great swimmer (me) it looks a very long way but everyone seemed happy to have finished as they climbed the ladder out of the water. 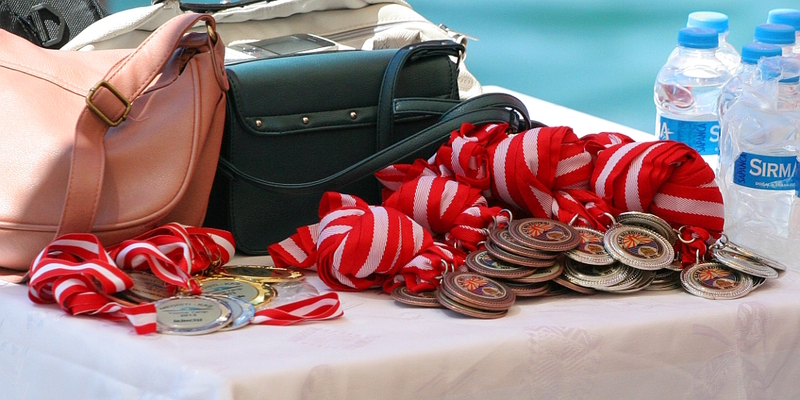 There were medals for everyone who finished. This team of girls all finished together and were delighted to have taken part by the look of it. One hero even had the strength for some Butterfly strokes at the end of it! Well done to all of you, see you again next year. 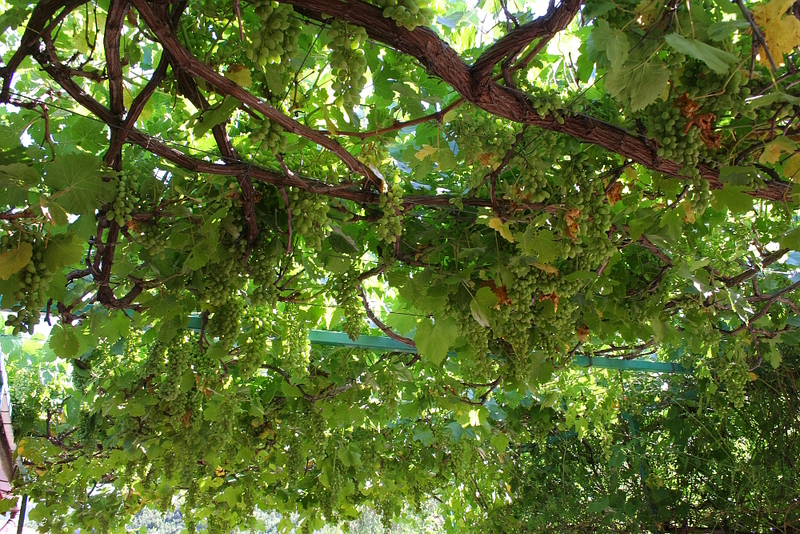 Back in January I pruned my vines carefully so that they would grow the most grapes that they could. I do it every year now, I don’t want the vines to extend any more so it seems obvious to go for the most grapes. Well this year it has worked a treat because it looks as though I’m going to have the biggest crop ever. 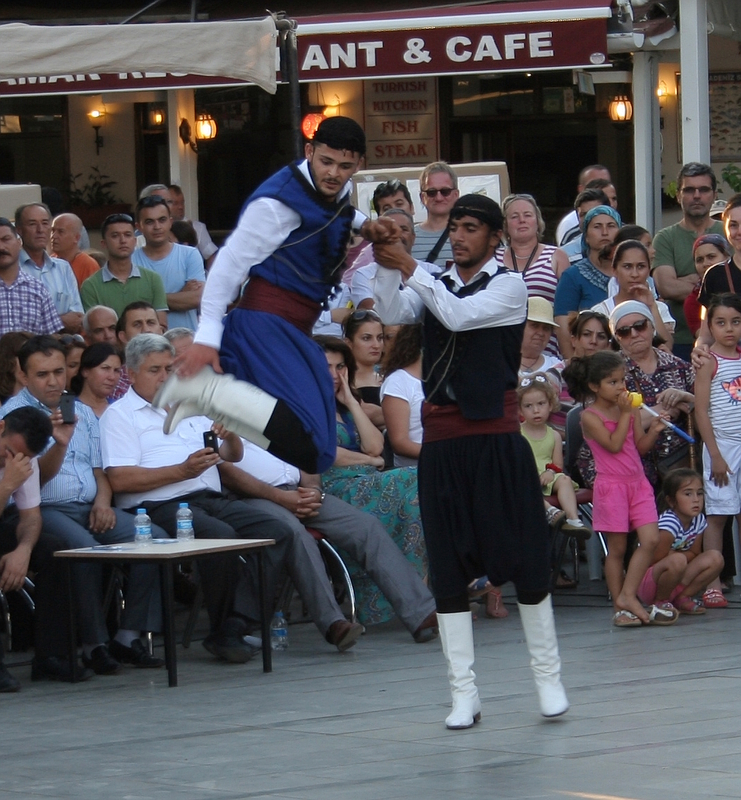 The annual Kaş Festival started yesterday so I had a look and took a few photographs. It will be continuing for the rest of the weekend so I’ll be taking a lot more. The opening ceremony included a demonstration of Greek dancing by a troupe from Meis, a couple of the young men were throwing themselves into the air rather spectacularly, made me think back to the time I used to do Zorba’s Dance in Cyprus thirty years ago. 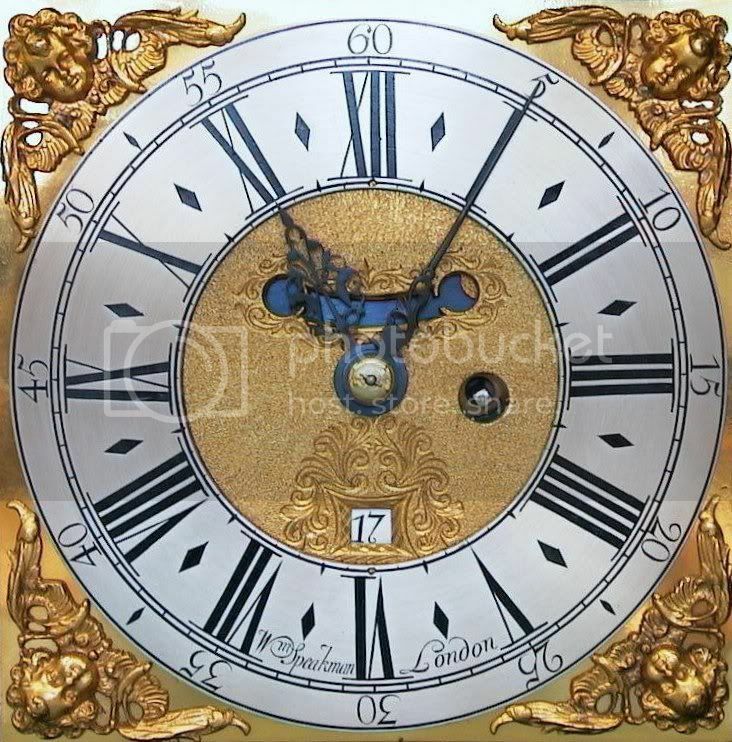 A lot of visitors came over from Meis for the occasion and although we often hear a Greek voice here in the market it is nice to hear so many all at once among the crowd in the square. Recently there has been a public airing of disapproval at the government attempt to ride roughshod over public opinion regarding lifestyle in Turkey. 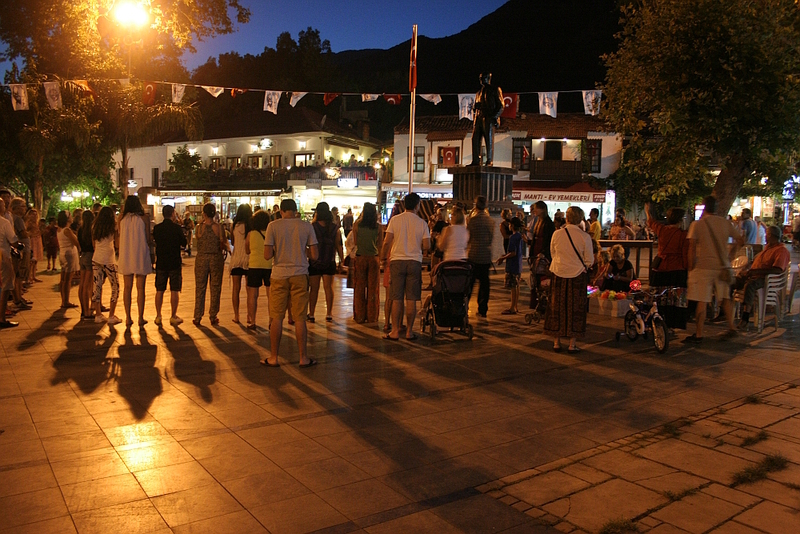 There have been demonstrations in many cities and towns and Kaş has been no exception. After the dancing and the formal opening ceremony a small group continued to voice their disapproval. In typical Kaş fashion this was done in a very refined and polite way accompanied by gentle applause from the throngs of tourists and locals out for the evening. 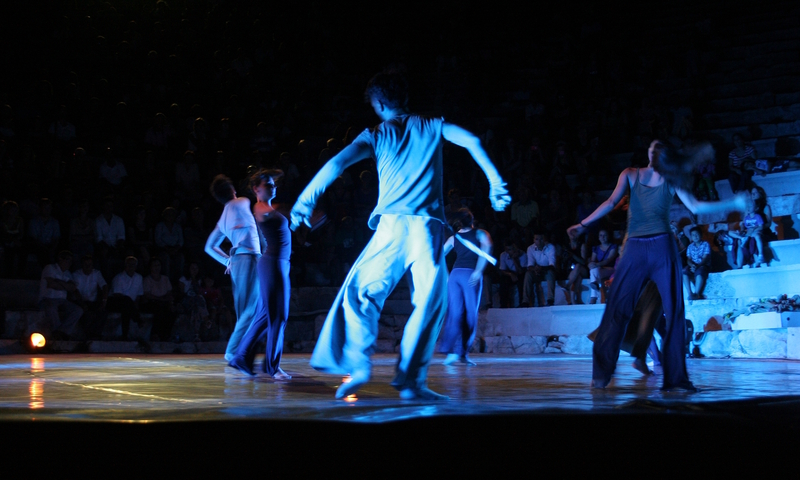 A modern dance group from the Turkish State Ballet in Istanbul performed a series of wonderful dance routines at the ancient Greek theater and received a standing ovation at the end. 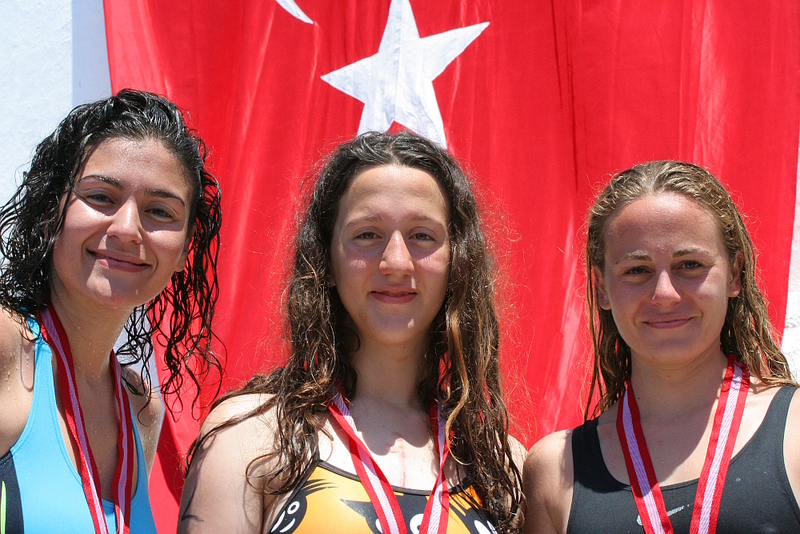 Hopefully there will be more to post about from this evenings entertainment and tomorrow (Sunday) the annual Meis to Kaş swimming race will take place starting at 8am. Looking forward to seeing that. This time of year is breeding time for the Loggerhead turtles here on the Mediterranean beaches. After a struggling up the beach at night to dig a hole the female turtles lay their eggs in the sand and cover up the hole. They make an effort to dig the hole far enough away from the water for the sand to be dry and warm enough to incubate their eggs. In this picture you can see the tracks that the turtle made as she came and went, the eggs were laid where the two tracks met. I’m not sure which track is the coming and which the going one but they must have only been made a day or two before I saw them. 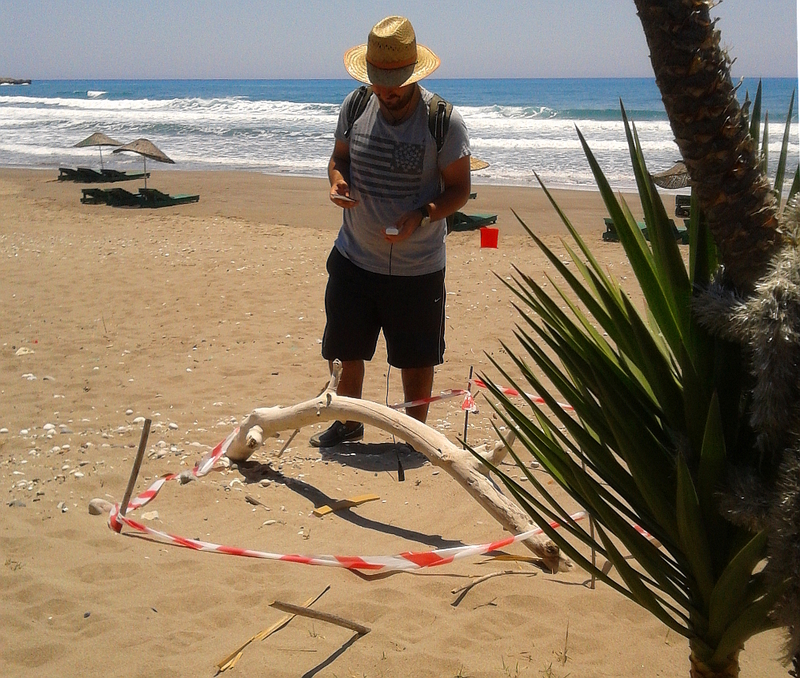 This is Rami on the beach at Demre, he is a research assistant and was going round measuring the temperature of each of the nests, there are ten on this beach. 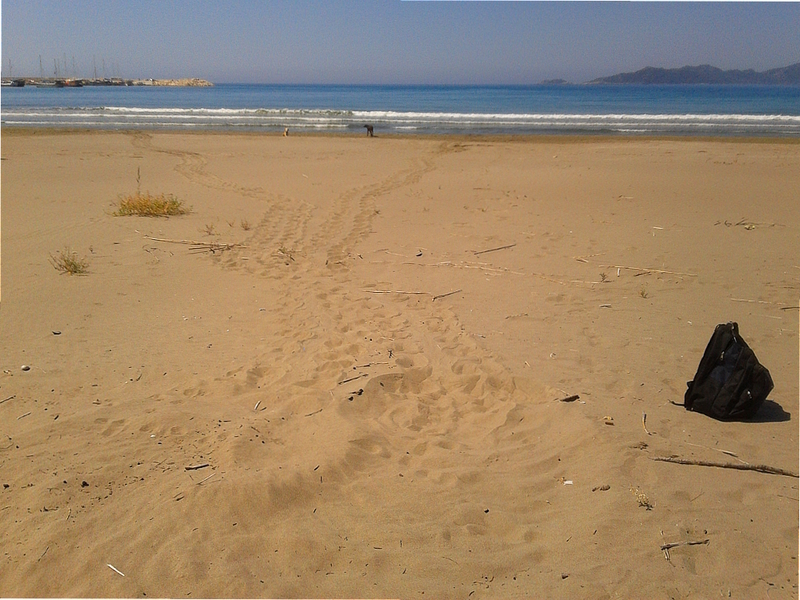 On the 7Km beach at Patara he said there are over one hundred nests. The eggs take between forty and forty five days to hatch, I hope they are all successful and the babies can find their way to the sea for their epic journeys around the world’s oceans before they come back to breed here again. It was wonderful to see this activity that I had only ever seen on television before.